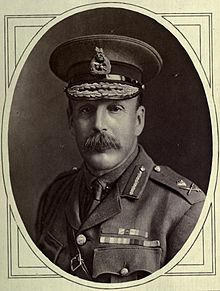 Lieutenant General ‘Sir’ Frederick Stanley Maude KCB, CMG, DSO, Commander in Chief Mesopotamian Expeditionary Force dies of cholera at age 51 in Baghdad. While leading the attack on Ramadi Maude went down with cholera and although he was quickly taken back to Baghdad he dies there today. Rumours circulate that he had been poisoned but the evidence suggests that he probably contracted the disease from contaminated milk. Maude was born in Gibraltar into a military family; his father was ‘Sir’ Frederick Francis Maude – a general who had been awarded the Victoria Cross in 1855 during the Crimean War, and who is buried in Brompton Cemetery, London. He attended Eton College and then the Royal Military College, Sandhurst. He graduated in 1883 and joined the Coldstream Guards in February 1884. Maude first saw active service in Egypt from March to September 1885, where he was awarded the Egyptian Medal and the Khedive’s Egyptian Star. He next saw service as a Major during the South Africa War, where he served from January 1900 to March 1901 he won a DSO and the Queen’s South African Medal. From 1901 to 1904, he served on the staff of the Governor-General of Canada, in which capacity he accompanied the Duke and Duchess of York on their Royal Tour of Canada in September and October 1901. He returned to Britain to become second-in-command at the Coldstream Guards and then he joined the General Staff, was promoted to Lieutenant-Colonel in 1907 and Colonel in 1911. In the Great War Maude first served in France. He was a staff officer with III Corps when, in October 1914, he was promoted to Brigadier-General and given command of the 14th Brigade. He was wounded in April 1915 and returned home to recover. He returned to France in May and, in June, he was promoted to Major-General and transferred to command the 33rd Division still in training. In mid-August, however, Maude was instead given charge of the 13th Division in Suvla. The 13th suffered heavy casualties retreating from Suvla and landing and later evacuating from Helles before being shifted to Mesopotamia in March 1916. Maude arrived to catch the end of the British failure at the Siege of Kut where he was promoted to Lieutenant-General, replacing General George Gorringe as commander of the newly dubbed Tigris Corps (III Army Corps) in July 1916. Despite being instructed to do no more than hold the existing line, Maude set about to re-organising and re-supplying his mixed British and Indian forces. He was made commander of all Allied forces in Mesopotamia in late July 1916, replacing ‘Sir’ Percy Lake. Given reinforcements and more equipment, Maude directed his force in a steady series of victories. Advancing up the Tigris and winning the battles of Mohammed Abdul Hassan, Hai and Dahra in January 1917, recapturing Kut in February 1917 and then taking Baghdad on 11th March 1917. From Baghdad, he launched the Samarrah Offensive and extended his operations to the Euphrates and Diyala rivers. After a lull over the summer, by November his forces were engaged at Ramadi and Tikrit when he became ill from cholera. Curiously, he died in the same house as German General von der Goltz a year earlier. He will be succeeded by General Marshall, who takes a more passive approach as a commander. The light cruiser HMS Blonde is leading the submarines K1 (Commander C S Benning), K3, K4 and K7 in line ahead off the Danish coast when she is forced to turn sharply to port to avoid three cruisers that cross her bows from starboard to port. The abrupt change of course takes the submarines by surprise and K1 and K4 collide. K1 had stopped due to salt water instead of fuel coming through the sprayers and extinguishing her boilers. K3 passes close on the port side. K4, following K3, suddenly observes the red light of K1 and although taking avoiding action strikes K1 a glancing blow abreast the conning tower. Water pours into the control room. Within minutes, chlorine gas was being released from the batteries. Blonde is signaled that K1 is sinking and the cruiser closes lowering two cutters. Rescue boats make five trips and transfer all 56 members of the crew to Blonde. A discussion is then held as to whether K1 can be saved and it is decided to sink her. At 06:23 in the early morning dark the German submarine UC-47 is found by HMS P-57 (Lieutenant Commander Harry Charles Birnie), one of sixty patrol boats designed specifically to hunt submarines. It has bows of hard steel for ramming U-boats, a 4-inch gun, pom-poms and two special depth-charge throwers. A lookout on P-57 spots a “big buoy” which turns out to be the conning tower of the submarine only two hundred yards away. P-57 swings violently to port by her commander and her engines race at full speed ahead. The patrol boat strikes the submarine just before the conning tower and almost at a right angle to the hull. The force of the attack drives the submarine down and away and she starts to pass astern the patrol boat. The crew of P-57 quickly releases a depth charge and then turn and releases another. Soon oil is seen coming to the surface close to a buoy the patrol boat has dropped and P-57 drops another depth charge. P-57 patrols around for the rest of day and the next night but none of the German submarine’s crew comes to the surface. Commander Birnie will be awarded the Distinguished Service Order for this action. Lieutenant Matthew Halligan (Dublin Fusiliers attached Royal Flying Corps) is accidentally killed at age 36. His brother died of wounds in May 1915. Second Lieutenant John Patrick Waters (Royal Flying Corps) is accidentaly killed when his plane falls apart on landing at age 28. He is the only child of Brigadier General Wallscourt Hely Hutchinson Waters CVO CMG. Private Frederick Charles Nunn (Manchester Regiment) is killed at age 19. His brother was killed in September 1916.